Irondequoit Bay Park West was the second park in Monroe county to be opened to shared-use trails. A network of brand-new trails designed and constructed by GROC volunteers takes riders along a ridge overlooking the bay, through an open canopy showcasing a variety of local plants and wildlife. Great experiences can be had here by riders of any skill level, and there are multiple ways into the park. Main trailheads are available near the Irondequoit Fish & Game Club at 658 Bay Front South, and at 400 Orchard Park Boulevard. Click here to download the latest printable trail map. For interactive maps, visit Irondequoit Bay Park West on MTB Project. 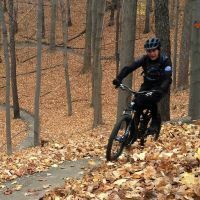 The trails have been getting a much needed tune-up after the winter months and recent wind storm damage. 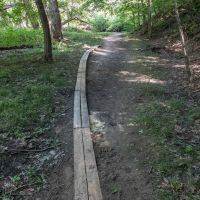 Thanks to volunteers and the County's forestry department, the trails are free of downed trees and most of the unsafe leaning trees have been removed. 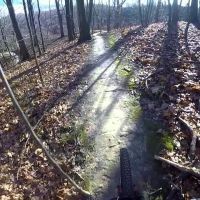 So far this season, we've also been buffing and building to optimize flow and fun factor, and the trails are in great shape. GROC leadership has submitted a series of projects to the County for review and are awaiting feedback and approvals. 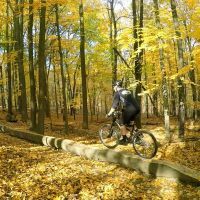 Proposed projects for this season include: a lower Purple trail for loop connectivity, through connectivity for the Red trail and decommissioning a section of Orange, and a rework of the Purple access point at the top of Orchard Park Blvd. We are also in the beginning phases of planning for a skills area that will overlook the bay. 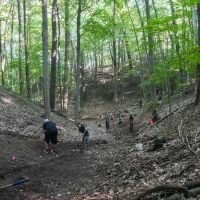 Stay tuned to GROC Trail Crew Meetup and come dig with us! Conditions have been outstanding, but it’s raining for a couple of days. Switch to riding on the road this weekend.